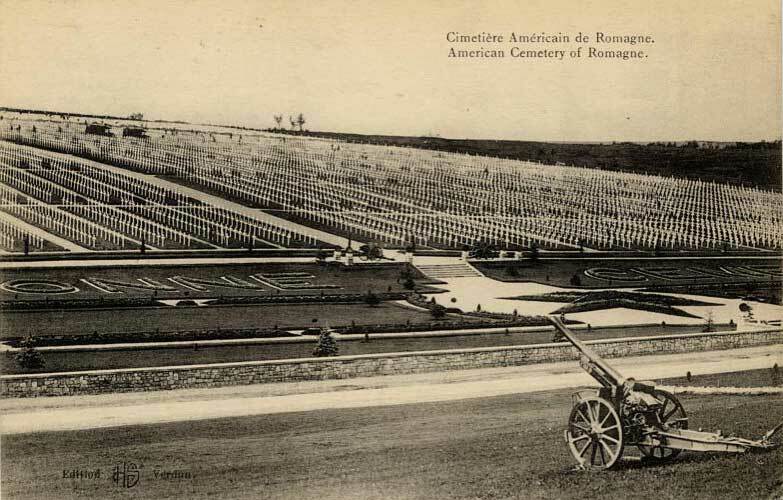 Within the Meuse-Argonne American Cemetery and Memorial in France, which covers 130.5 acres, rest the largest number of US military dead in Europe, a total of 14,246. Most of those buried here lost their lives during the Meuse-Argonne Offensive of World War I. The immense array of headstones rises in long regular rows upward beyond a wide central pool to the chapel that crowns the ridge. A beautiful bronze screen separates the chapel foyer from the interior, which is decorated with stained-glass windows portraying American unit insignia; behind the altar are flags of the principal Allied nations. The cemetery was established on 14 October 1918 in an area captured by the US 32nd Division. It now contains the graves of 14 246, including 486 unknown soldiers. Panels on the Memorial Chapel walls record the names of a further 954 missing.As a comparison the WW2 D-Day Landings Cemetery in Normandy contains 9 386 graves The graves are divided up into eight separate plots each surrounded by linden trees.